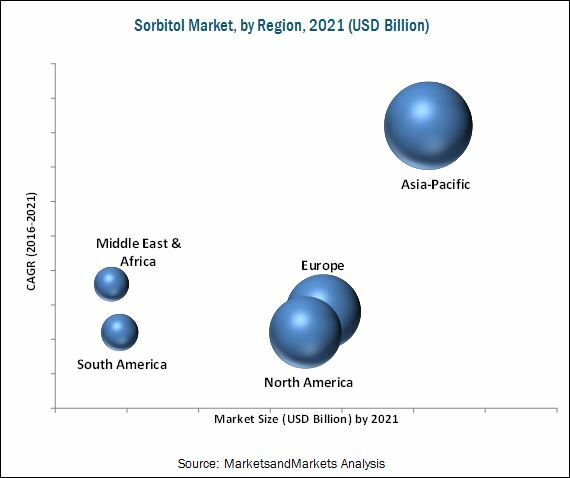 The global sorbitol market is projected to reach USD 1,418.6 million by 2021 at a CAGR of 5.3% from 2016 to 2021 in terms of value. The base year considered for the study is 2015 while the forecast period is from 2016 to 2021. Sorbitol is mainly derived from corn, seaweed, fruits, and berries. It is manufactured by the catalytic hydrogenation of sucrose. Sorbitol is primarily used as a sweetener, humectant, flavoring agent, and diuretic dehydrating agent for various applications such as food & beverage, pharmaceuticals, and cosmetics & personal care. Sorbitol is a sugar substitute with low-calorie, which is used in many products such as candy, gum, ice cream, baked goods, cosmetics, toothpaste, personal care, and pharmaceuticals. Consumers in developed countries are habituated to sedentary lifestyles and are aware of the problems associated with it. Hence, in the recent past, the demand for low-caloric food and sweeteners has been on the rise. As people need to reduce their calorie intake, they prefer low-calorie foods, which play a major role in helping them maintain a healthy diet that supports their lifestyles. Most health-conscious consumers prefer sorbitol as a sugar substitute because it contains fewer calories than regular sugar. Consumption of sorbitol is an easy way to reduce the calorie intake and stay healthy; fueling the demand for sorbitol in various applications, globally. The sorbitol value chain majorly includes raw material suppliers such as farmers, and harvesters who grow corn, wheat, and cassava. Sorbitol manufacturers such Roquette Freres (France), Cargill Inc. (U.S.), Tereos Starch & Sweeteners (France), Archer Daniel Midland (U.S.), and Ingredion Inc. (U.S.), and sorbitol based applications, namely, food & beverages, pharmaceuticals, cosmetics & personal care, chemical and bio fuel among others. In December 2016, Archer Daniels Midland (US) announced its capacity expansion of starches and sweeteners at its corn mill facilities in Razgrad (Bulgaria) and Adana (Turkey). This expansion is in response to seeking an opportunity in the Middle East and European markets by expanding the range of products to meet increasing demand. In December 2016, Cargill Inc. (US) expanded its presence in Shanghai (China) by introducing an innovation center in China named Cargill ONE for the production of animal protein, sweeteners, cocoa, edible oils, and starches. This expansion is focused on offering new flavors and innovative food products in China. In November 2016, Ingredion Incorporated (US) acquired Shandong Huanong Specialty Corn Development Co., Ltd. (China). This acquisition aims at increasing production of specialty ingredients that includes starch and sweeteners products. This acquisition adds to the company’s second manufacturing facility operations in China. In June 2016, Archer Daniels Midland (US) acquired Casablanca (Morocco), a corn wet mill that produces native starch and glucose for applications in various industries. This acquisition aims at strengthening the company’s global position in the starch and sweetener market and meeting the global sorbitol demand in the near future. This research report categorizes the global market of sorbitol on the basis of product type, application, and region. It provides a forecast of the market size, in terms of value and volume, and an analysis of trends in each of the submarkets. Market analysis for additional countries. The global sorbitol market is estimated to reach USD 1,418.6 million by 2021 at a CAGR of 5.3% from 2016 to 2021. The sorbitol market has witnessed significant growth in the recent years. Sorbitol, due to their functionalities, functionalities such as sweetening agent, non-cariogenic, cooling effect, free flowing powder, good blend homogeneity, coating agent, sugar free, low-calorie, filler/diluent, good compressibility, and granulating agent are used in a wide range of applications, including as cosmetic & personal care, pharmaceuticals, and others. The main types of sorbitol are liquid/syrup sorbitol and crystal/powder sorbitol. Liquid/syrup sorbitol type is estimated to lead the sorbitol market in 2016, due to the suitability of liquid/syrup in several applications. Not only highest, but also it is estimated to witness the fastest growth during the forecast period, due to its increasing adoption in various day-to-day consumer applications as a low calorie sugar substitute. The demand for liquid sorbitol is very high in all regions due to its ease of use and low manufacturing cost. On the other hand, powder sorbitol has limited applications in the food and pharmaceuticals industries. However, factors such as adherence to international quality standards and regulations may hinder the growth of the market. Sorbitol is used in applications, including cosmetics & personal care, food & beverage, pharmaceuticals, chemicals, and others. These are the main applications considered in the report. t. The cosmetics & personal care segment led the global sorbitol market, accounting for a share of 39.5%, in terms of volume, in 2015. This dominance is owing to the increasing demand for sorbitol in oral care products such as toothpaste, mouthwash, mouth freshener, and chewing gum. Sorbitol is suitable for use in various applications such as cosmetics & personal care, food & beverage, pharmaceuticals, and chemical industries. In cosmetics, sorbitol is used as skin conditioning agent and humectant in mild soaps, aftershave lotions, and baby shampoos. In personal care products, it is widely used as a sweetening agent and provides cooling effect in toothpaste, chewing gums, and mouth fresheners. Sorbitol is an essential ingredient in the food & beverage industry. It is used as a humectant and sweetener in the food & beverage industry to increase sweetness, shelf life, and freshness of food and beverage products. Sorbitol contains 2.6 calories per gram, due to which it is used as a low-calorie sweetener. It is consumed majorly in diabetic food. Also, owing to sorbitol’s moisture-stabilizing property, it preserves commercial food products from getting hardened or dry and sustains their freshness throughout storage. Its dosage in food & beverage applications is controlled as per the FDA and other regulatory bodies. Sorbitol is used as a key bodying agent in many pharmaceuticals applications such as syrups, tablets, and elixirs. It is used in syrups for reducing bottle caps stickiness to bottle due to the presence of sugar. It acts as good plasticizer and humectant which makes it applicable in non-fat soluble ointments, emulsion ointments, and gelatin capsules. The excellent spreading capacity makes it applicable in creams, ointments, and pastes. Roquette Frères (France), Cargill Inc. (US), Ingredion Incorporated (US), Tereos Starch & Sweeteners (France), and Archer Daniels Midland (US) are the key companies operational in the sorbitol market. 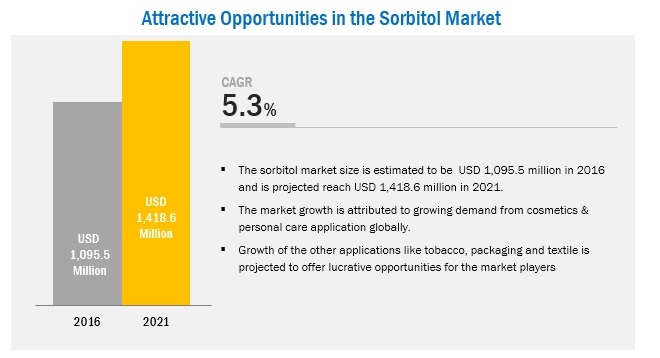 Entering into related industries and targeting new markets will enable the sorbitol manufacturers to overcome the effects of volatile economy, leading to diversified business portfolio and increase in revenue. Other major manufacturers of sorbitol are SPI Pharma Inc. (US), Ecogreen Oleochemicals Pte. Ltd. (Singapore), Merck Group. (Germany), Sukhjit Starch & Chemicals Ltd. (India), and Gulshan Polyols Ltd. (India). 12.6 Ecogreen Oleochemicals Pte. Ltd.
12.10 Sukhjit Starch & Chemicals Ltd.
12.11.2 Gujarat Ambuja Exports Ltd.
12.11.3 Qinhuangdao Lihua Starch Co. Ltd.
12.11.5 Jeecon Foods Pvt. Ltd.